From big water to farm ponds, Indiana has great fishing year-round. Hoosier anglers have many choices of where to fish these days: huge reservoirs, tiny farm ponds, sprawling natural lakes and mighty rivers. Each hold fish populations as diverse as the habitat where they live. Popular fish species abound, but where to start? One of the most popular lakes for ice-fishing in northeast Indiana is Steuben County’s Crooked Lake. Why? Walleyes. The Indiana Department of Natural Resources has stocked larger (7 inches long) fingerling walleyes at the lake every fall(except, since 2001), developing a wide size range of walleyes. Many ice-anglers target walleyes in the lake’s first basin, drilling their holes over likely fish-holding vegetation. Points also hold fish and provide travel lanes leading up from deeper water. The best time to fish is commonly from dusk until the first couple of hours after dark. OTHER OPTIONS: J.C. Murphey Lake, Northern Pike: Use tip-ups set with large shiners (alive or dead) in the deeper channels for cruising pike. Kankakee River, Walleyes: Walleyes bite in open-water areas around the mouths of creeks and ditches. 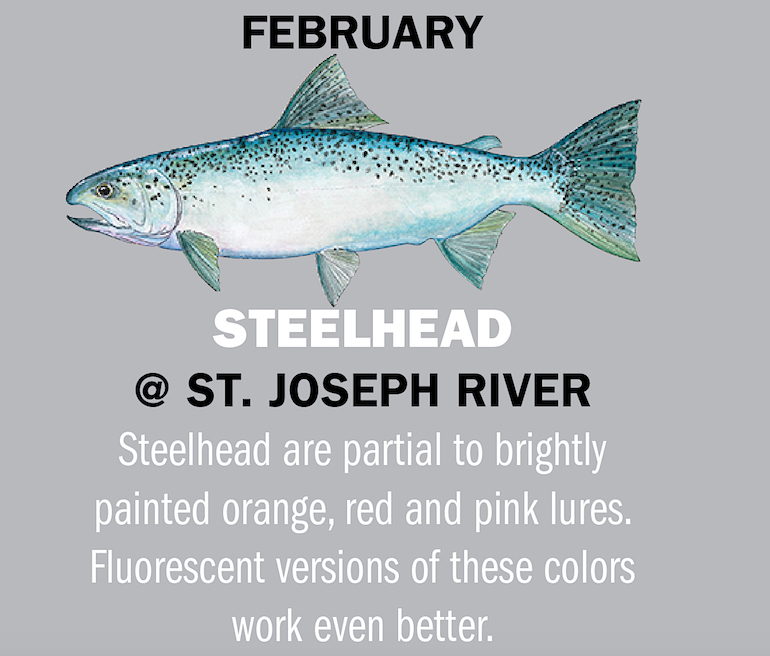 Hardy anglers know the St. Joseph River, where it flows through Mishawaka, is always a good bet for winter steelhead fishing. Many shoreline areas throughout the city, all the way up to Twin Branch Dam, can produce good catches. One of the most popular spots to target them is just downstream from the Twin Branch Dam. The south side of the river provides the best access for shore fishing. Anglers use a variety of baits and methods for targeting winter steelhead, but small natural baits are hard to beat. Drift dime-sized spawn sacks, shrimp and live night crawlers just above the bottom. Top artificials include inline spinners, casting spoons and shallow-running crankbaits. OTHER OPTIONS: Lake Maxinkuckee, Bluegills: Fish small ice jigs tipped with bee moths or spikes near the bottom. Ohio River, Sauger: Hungry sauger that mass below Ohio River dams hit jig-and-minnow combinations bounced along the bottom. Indiana’s portion of the Ohio River is a great sauger fishery. From areas below Markland Locks and Dam, all the way west to Myers Pool, the waters below each of the Ohio River’s dams teem with schools of sauger during their annual spawning runs. 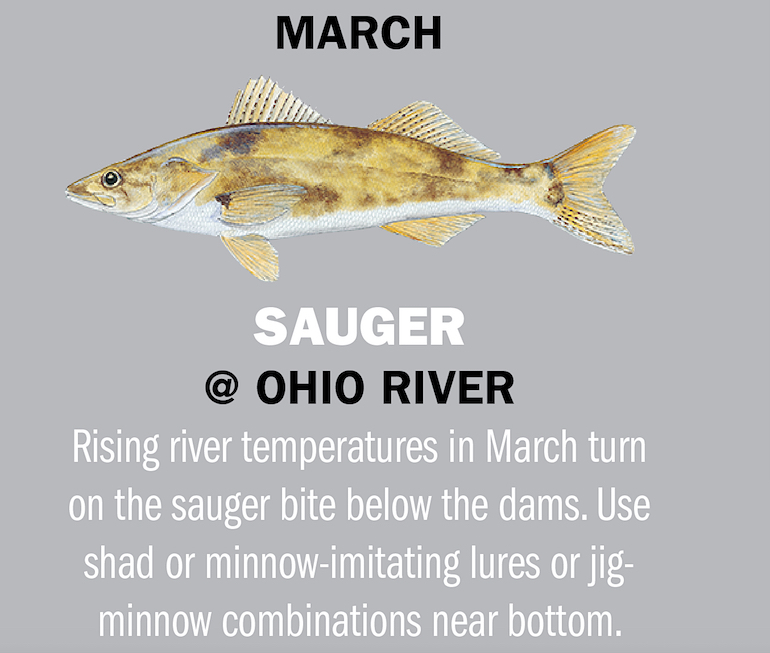 Sauger fishing should be fantastic during February, March and even early April as the fish run to spawn. Fish that measure 10 to 18 inches are common and abundant. When the bite is hot, dozens of anglers fish from boats below the dams. Fishermen should use shad- or minnow-imitating lures or jig-and-minnow combinations near the bottom. OTHER OPTIONS: Lake Michigan, Brown Trout: Early season browns feed near industrial warm-water discharge sites along Lake Michigan’s southern shoreline. Little Calumet River, Steelhead: Look for spawning steelhead on gravel beds or in deep pools above or below spawning areas. 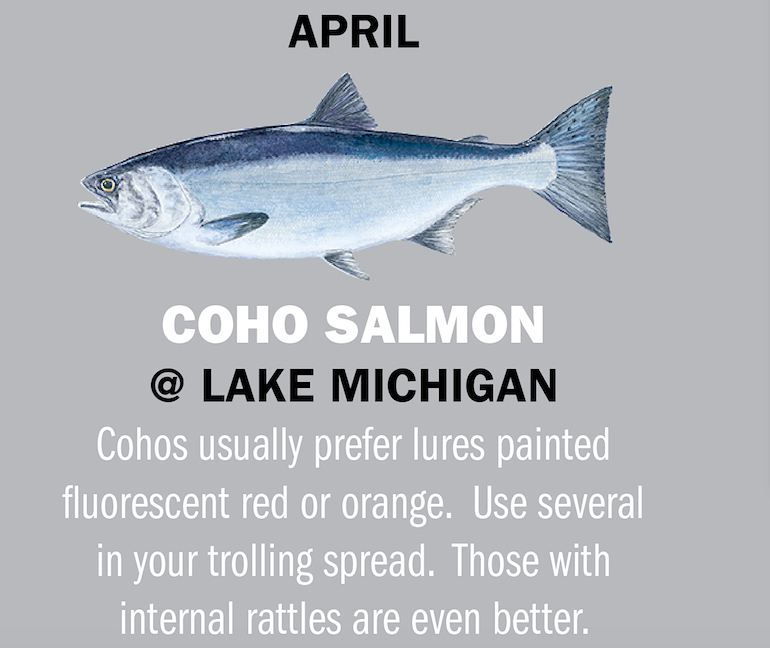 Coho salmon from throughout Lake Michigan are attracted this month to the lake’s warm southern waters in springtime, and limit catches (five salmon per angler) are often the norm. Boat ramps from Hammond to Michigan City will be busy with trollers launching their crafts. Lakewide, coho stocking has been consistent over the past several years with about 2.5 million fish released annually. Good spring coho fishing depends on many factors, including favorable water temperatures and beneficial wind and wave conditions. Good weather sees schools of Coho salmon roaming the near-shore waters searching for food. Anyone who gets a lure in front of the fish will have a good chance of connecting. OTHER OPTIONS: Lake Waveland, Largemouths: Big bass feed in shallow water this month, relating to weeds and other structure. Patoka Lake, Crappies: Larger crappies should be active around submerged stumps and brush piles, holding very tight to the cover. A certain amount of uncertainty lies with baitfish (alewives) populations and natural reproduction of kings, but the Chinook salmon continue to support incredible springtime fishing. Lake-wide, the alewife population is low but increasing over previous years’ numbers. The kings are finding those baitfish, as several big fish caught in 2018 from Indiana ports tipped the scales at 20 to 30 pounds. Trollers should follow the baitfish offshore and set their lines deeper in the water column to target kings. Downriggers are standard tools for getting trolling spoons deep into the strike zone, from the middle of the water column downward. Dipsy Diver disks are also useful for getting spoons and dodger-and-fly combos deep and right/left from the path of the boat. OTHER OPTIONS: J.C. Murphey Lake, Bluegills: Target bluegill spawning colonies in shallow water for fast action. 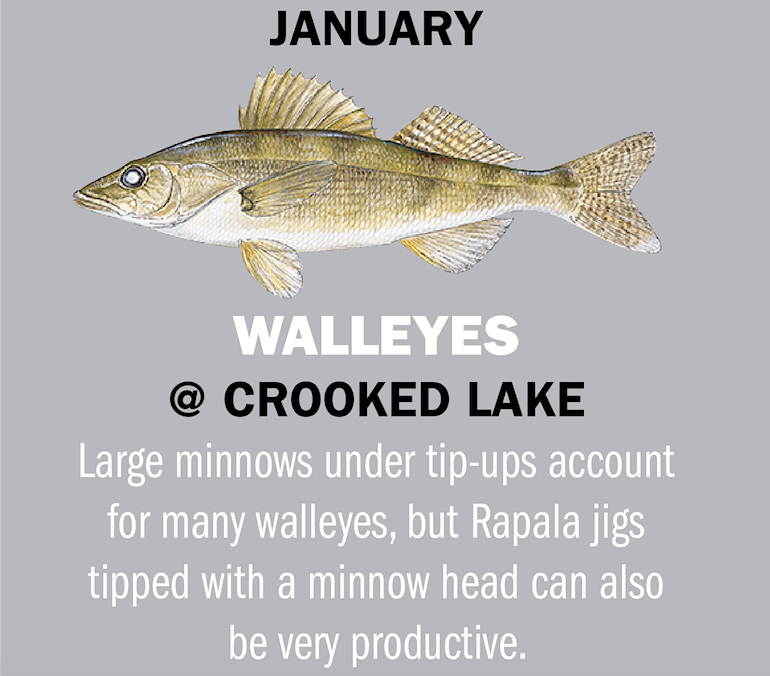 Prairie Creek Reservoir, Walleyes: Whole night crawlers and live minnows hopped along the bottom take wary walleyes. Bruce Lake in north-central Indiana may not be home to a huge population of largemouth bass, but across its 245 acres it holds a surprising number of lunker-sized fish. It is not a high catch-rate lake, but it produces better than the average lake for bass measuring 18 inches and longer. The lake’s submerged vegetation extends out to depths of about 10 feet, where the bottom drops into deeper water. Some of the larger bass can be caught along these weedy break-lines. Also, check out a couple underwater humps that rise near the middle of the main basin. Anglers can expect shad-imitating lures to bring good action. OTHER OPTIONS: Lake Monroe, Crappie: The larger crappies hold on and aroundwoody structure throughout the lake. Middlefork Reservoir, Largemouth Bass: Try fishing submerged brush piles along the shorelines with crankbaits or plastic night crawlers. Cedar Lake in the northwest corner of the state holds a bunch of channel catfish, and they are almost always willing to bite. This 781-acre lake carries some really nice fish — up to 10 pounds and more. They can be caught all along the shoreline areas, especially near the boat ramp. Tactics are simple: Get a smelly bait in the water and keep it on the bottom where a whiskerfish will find it. Some anglers cast baits far out onto the shallow flats adjacent to shore, but many of the best fish are caught after dark along the concrete breakwall near the launch. Night crawlers are a popular bait, but cut-bait is good, too. The lake is absolutely full of white perch and gizzard shad. OTHER OPTIONS: Lake Monroe, Wipers/Hybrid Striped Bass: Wipers often chase shad to the surface and “bust” them. Get a lure into the fray for amazing action. Hovey Lake, Flathead Catfish: Fish for massive flatheads at night using large live baits, like bluegills or other hardy fish. The scenic Wabash River runs nearly from one end of Indiana to the other. It is absolutely full of jumbled root wads, logjams and brushy underwater obstructions that make the river home to a tremendous catfish population that includes flatheads, channel cats and even some blue catfish. 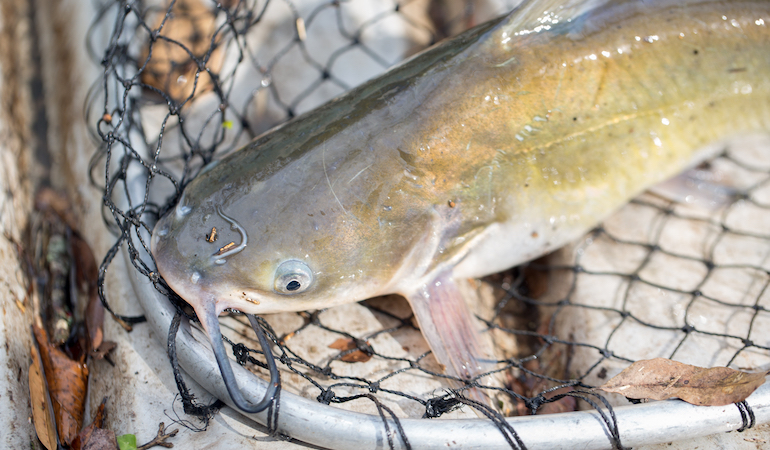 The flatheads are the target of the river’s serious catfish hunters, who find them in good sizes along the mid- to upper reaches of the Wabash. Fisheries officials say the highest number of flatheads caught in their surveys occur near Williamsport, where the fish average about 23 inches long, but much larger fish are available, upward of 40 pounds. Flatheads sometimes forage during daylight hours, but they are mostly nocturnal and come out at night to hunt. Big flatheads are fish eaters, and under cover of darkness they cruise shoreline snags, searching for dinner. They prefer live fish, and bigger is better. Large, lively 8-inch bluegills are standard baits, but similar-sized carp and drum can also take flatheads. OTHER OPTIONS: Sugar Creek, Smallmouths: Summertime smallmouth bass will be active in the creek’s deeper pools. Wabash River, Channel Catfish: Wabash channel cats will eat almost anything: worms, crayfish, live minnows, dead fish and cut bait. White River may be known as a catfish hotspot to some anglers, but it is also quickly becoming a bass fishing hotspot. Smallmouth bass, largemouth bass and even spotted bass are all present in the river system in different areas, but smallmouths, in particular, have anglers excited, especially around Noblesville and areas upstream, where the fish measure upward of 20 inches. Smallmouth are great ambush predators, often hovering in holes and under logs, just waiting for schools of minnows to swim by. They also position themselves on the edges of current seams where aquatic insects and injured minnows might be swept past them. The river north of Noblesville is fairly shallow (2 to 5 feet) with some holes as much as 11 feet deep. The bottom is gravel and rocks with some sand and silt. Plenty of overhanging trees and vegetation, plus numerous logjams and root wads, provide cover for the fish. Fish lures that match the baitfish. OTHER OPTIONS: Lake Michigan, King Salmon: Mature Chinook salmon can be caught at dawn at the mouth of Trail Creek near Michigan City. Patoka Lake, Largemouths: Look for hefty largemouth bass around weed beds out on the main lake. The fall bite for blue catfish on the Ohio River can be great, especially if the weather cooperates. Stable weather patterns and normal river flows will encourage the big blue cats to keep biting all month long. Blue catfish are fish eaters. Gizzard shad and skipjack herring are two of their favorite foods, but they also eat emerald shiners, small carp, drum and any other small fish they can catch. Blue cats grow fast on this fish diet. In August 2018, Tell City was the site of a local Cabela’s King Kat tournament on the Ohio River. Tournament anglers fished the stretch of river from the McAlpine Dam to the Newburgh Dam and caught a lot of big blue catfish. The big fish of the tourney was a trophy blue that weighed 50.8 pounds; the second-place fish was another blue cat, weighing 47.38 pounds. OTHER OPTIONS: Cecil Harden Reservoir, Striped Bass: Target trophy-sized striped bass by trolling large shad-imitating crankbaits. Blue Grass Pit, Muskies: Large swimbaits do a good job of imitating the fish that muskies normally eat. Lake Tippecanoe in Kosciusco County is a 768-acre natural lake and part of the Tippecanoe chain of lakes, including Oswego, Tippecanoe and James lakes. Characterized by deep water, steep drop-offs and a lot of structure, Tippecanoe is home to giant muskies that lurk around submerged humps, sharp break-lines and the edges of large weed beds and weedy points. Troll lures, cast lures or fish live baits, such as suspending live suckers beneath a large float. The state-record muskie — 50 inches long, weighing 42.5 pounds — was caught in 2002 in neighboring James Lake, which shares its water with Tippecanoe by way of a common channel. Anglers do well with appropriate tackle for big muskies — premium rods and reels, heavy lines and steel leaders. OTHER OPTIONS: Brookville Lake, Walleyes: Fish jigging spoons along underwater points and drop-offs for late-season Brookville walleyes. Lake Michigan, Lake Trout: Trolling large spoons for spawning lake trout outside the Port of Indiana reef near Portage. Lake Wawasee near the town of Syracuse, in Kosciusko County, is a favorite among local ice-fishermen for good reason. This 3,400-acre natural lake is well-known as an early ice-fishing hotspot for panfish, especially nice-sized crappies. Several shallow, manmade channels on the northeast side of the lake are protected from the wind and usually freeze first. Once safe ice sets in, anglers start drilling holes and searching for active crappies. The dark-bottomed, dead-end channels always seem to attract good numbers of crappies. Crappies are often right on the bottom. Suspend live minnows or ice jig-and-minnow combos several inches above the bottom. OTHER OPTIONS: Lake Maxinkuckee, Yellow Perch: Find perch hitting live minnows and small jigs near underwater humps and other structure. Morse Reservoir, Crappies: Nice-sized crappies will bite underneath the lake’s permanent floating docks, right until ice-up.